Dycap Media Solutions accepts the Innovations Showcase People's Choice Award $10,000 prize. Dycap Media Solutions won the InfoComm 2016 Innovations Showcase People's Choice Award, and Arria Live Media won the Judges’ Choice Award, both handed out during the convention in Las Vegas. 18 companies exhibited solutions in the Innovations Showcase June 8-10 at the Las Vegas Convention Center. First introduced at InfoComm 2015, the Innovations Showcase is an area on the expo floor for both startups and companies new to the AV industry to introduce themselves to the InfoComm audience. In addition to demonstrating their solutions to attendees, exhibiting companies compete for awards for best innovation, as voted on by showcase visitors. 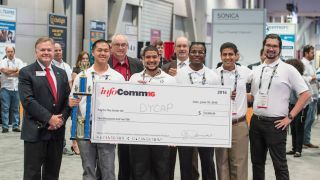 As the winner of the People's Choice Award, Dycap was presented with $10,000 and free exhibit space for InfoComm 2017. During the show, Dycap demonstrated its Perfect Track software for automating PTZ cameras using motion, edge and facial recognition. The software eliminates the need for camera operators and tracking beacons. "Attending the Innovations Showcase at InfoComm was a great move for Dycap to really let the market know we exist and how powerful our technology is. This single showcase has built out all the distribution channel partners we were aiming for, plus many more," said Armand Sepulveda, CEO of Dycap. "At Dycap, we want to fill the demand for video content in all industries by automating how it is captured and making it significantly more cost effective by using software. Winning the People's Choice Award really goes to show that the markets we want to serve think we have a good idea, and our mission resonates with them." Arria Live Media won the Innovations Showcase Judges' Choice Award for its networked pro-audio system, Arria.Live. The company won exhibit space at InfoComm 2017 valued at $5,000. Arria.Live eliminates the need for a mixer, as up to 32 inputs and unlimited outputs on a network automatically work together and are easily controlled with a simplified app. "The Innovations Showcase was a huge value for Arria Live, allowing us to reach a broad audience that generated several great customer opportunities," said Ed Arrington, CEO of Arria Live. "The Judges' Choice Award is a great honor reinforcing the value of Arria.Live technology in dramatically simplifying live audio for churches, schools, and community centers that do not employ professional sound engineers." A panel of industry experts visited the Innovations Showcase exhibitors throughout the show to learn about their products and select a Judges' Choice winner. The judges included Richard Blackwell, Innovations Showcase advisor and CEO of Linked2 Software; Fred Bargetzi, CTO of Crestron; Gary Kayye, founder and CEO of rAVe Publications; and Scott Walker, CEO of Waveguide. The Innovations Showcase judges also recognized Drywall Trapper, Department 60, Silexpro, and eTech as honorable mentions. "The Innovations Showcase brings together some of the most creative, imaginative and entrepreneurial talent that the AV industry has to offer,” said Blackwell. “It's such a unique opportunity for these entrants to spend so much time with so many other entrepreneurs sharing ideas and building friendships. InfoComm has become a parent and the Innovations Showcase is how it nurtures its young. I could not be more proud of the InfoComm leadership team for supporting the Showcase." "The AV industry runs on entrepreneurial energy. With that energy, powerful solutions are created," said Jason McGraw, InfoComm International senior vice president of expositions. "That's why we're so proud of the 18 new exhibitors we introduced this year at the Innovations Showcase. They keep our industry moving and evolving. Congratulations to this year's winners Arria Live and Dycap. Both companies wowed the judges and the InfoComm attendees." The complete list of exhibitors from the 2016 Innovations Showcase follows: Arria Live Media, Cahoots, Chatlight, ChitChat Communications, Comhear, Crystal Screens, Department 60, DryWall Trapper, Dycap Media Solutions, etech Events, IMAGsystems, Meural, Silent Call Communications, Silexpro S.A.L., Trade Show Internet, Vyopta Inc., West Pond Enterprises and Wifi-Texas.com.